In Europe, fusion research is structured around a goal-oriented roadmap that closely involves universities, research laboratories and industry. Sibylle Günter, the scientific director of the Max-Planck Institute for Plasma Physics (IPP) in Germany, can speak to how the framework works from the inside. 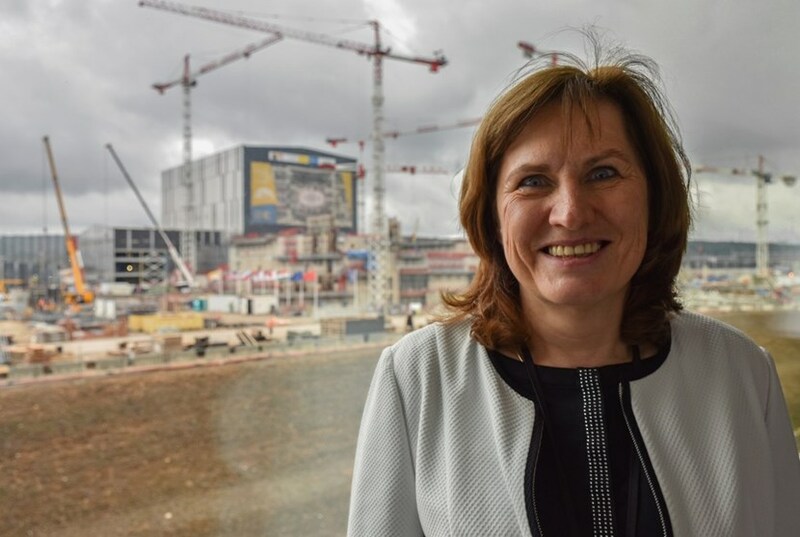 During a recent visit to ITER Headquarters she was able to give us her views on the advantages of broad scientific cooperation on fusion and how ITER is benefitting. Sibylle Günter sheds light on how scientific cooperation in Europe benefits fusion research. Europe is home to many different fusion devices, all conducting experiments in the quest for fusion electricity. How do they work together? EU countries have a long history of working together on fusion research. With ITER being the main goal of these efforts, we use many of the already existing devices to prepare for ITER operation by exploiting their specific strengths. It's like a step ladder approach—we can test new ideas with the smaller and more flexible machines. Let me give you an example. The tokamak at IPP, ASDEX Upgrade, has a very similar shape to JET (Joint European Torus) and ITER. Carbon used to be the material considered for the plasma chamber walls. But, carbon is easily eroded by the plasma and it traps the plasma fuel tritium. So, we were pioneering tungsten as the material for the plasma chamber wall instead of carbon. Tungsten is a metal that was under consideration due to its very high melting point. But as it is not fully ionized, even at fusion-relevant temperatures, it emits significant line radiation. Therefore, you can tolerate only a tiny amount of tungsten in the plasma of a fusion power plant. We ran several campaigns with tungsten as the plasma chamber wall material at ASDEX Upgrade and learned how to avoid tungsten accumulation in the plasma centre. When the results came back positive, JET used tungsten to build an ITER-like vessel wall. The ASDEX Upgrade scientists supported JET in learning to operate with metal walls. Now, JET is the machine that ITER can rely on for findings on a tungsten divertor. We have a really successful joint program in preparing ITER operational scenarios. We exploit our facilities in a joint and coordinated manner. We all focus on ITER wherever possible, but we are open-minded and are also looking ahead at DEMO, the demonstration fusion power plant that will come after ITER. The successful operation of the ITER plant is the spearhead of the European fusion research. How can work at ITER contribute to the research efforts at Europe's laboratories and fusion devices? I hope we will learn a lot. We all work for ITER because we want to see a burning plasma. We want to learn from ITER how plasma physics work in a running fusion reactor and feed the findings back into the development of our DEMO design. ITER will give us a whole catalogue of lessons learned that will help us answer many questions: How do we build a reactor? What can we learn from the ITER model on international cooperation? Which new technologies can we take on from ITER? Two different designs for a fusion power plant dominate current research—the stellarator and the tokamak. Do we need both? In 50 years of fusion research we have seen many different configurations for fusion devices, including new designs by start-up companies in the US. The first-ever fusion device was a stellarator, but it was outrivaled by the tokamak with its better confinement properties. Now, with the help of high-performance computers in optimizing the magnetic field structure, the stellarator can be made to work. Sibylle Günter is a German theoretical physicist, working primarily in the field of plasma physics. Although a theorist, she is passionate about practical applications of her field. Consequently, she became a staff scientist at the Max Planck Institute for Plasma Physics, IPP, in Garching, Germany, in 1996. Four years later, she assumed the position of Head of the Tokamak Physics Division. Since February 2011 she has been IPP's Scientific Director. There is no real competition between the two designs. Both have advantages and disadvantages. The tokamak's advantages come from its good plasma confinement properties, plus it is relatively easy to build. Its disadvantages relate mostly to the possibility of disruptions, which are the biggest fear for power plants. So, as long as we have not resolved the issue of disruptions we should continue looking at the stellarator design as an option in any case. Its advantages stem from its intrinsic steady-state operation and higher plasma densities. Does this mean that the stellarator design is considered an option for another DEMO project? In our EU roadmap, the DEMO fusion power plant is clearly based on a tokamak design. The stellarator has not yet proved that it can achieve the plasma confinement properties that the tokamak design has been demonstrating. This is the task of Wendelstein 7-X at IPP Greifswald. The EU roadmap has set a decision point regarding the future of the stellarator program at around 2025. In any case, we all work to make ITER a success, as the basis of a DEMO fusion power plant.